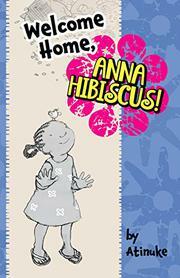 As the title indicates, Anna Hibiscus returns home to Africa from her visit with her Canadian family. All eight volumes of the Anna Hibiscus chapter-book series are now available. Although each story stands alone, readers who approach them in order will have a rich experience indeed, and in fact for this volume it may be preferable. The first chapter of this fifth volume recaps her trip to Canada (Have Fun, Anna Hibiscus!, 2011). It is only from context clues that readers learn that Anna has a Canadian grandmother as well as her African family. Transitioning readers unfamiliar with the earlier books and not alert to reading clues may find it confusing. Tiger Lily, a friend Anna met in Canada who is biracial, just like Anna herself, appears in the third chapter with almost no introduction. Snow White, Anna’s pet chicken, is hatched in the second chapter and becomes increasingly important in later volumes; here, she causes trouble by making messes while Anna is in school. Despite the African setting, these are sweet domestic stories North American readers will easily understand. Anna’s adventures and worries are small, recognizable, and happily resolved. This simplicity ensures success for new readers. The repetitive vocabulary (adults are repeatedly “cross, very cross” at Snow White’s antics) and simple sentence structure carry readers through the relatively lengthy chapters. Tobia’s expressive pencil drawings provide additional context and break up the text. ARE YOU SURE, MOTHER BEAR?